The acrostic AWANA comes from the first letters of Approved Workmen Are Not Ashamed (II Timothy 2:15). The purpose of AWANA is to reach boys and girls with the gospel of Christ and train them to serve Him. SBCGC started AWANA program in September 2002 with the blessings and encouragement from the church leadership team. Age: 3~¬12 years old (preschool – 6th grade). Registration fee: $35.00 per child. Dues: $1.00 each meeting. 1. 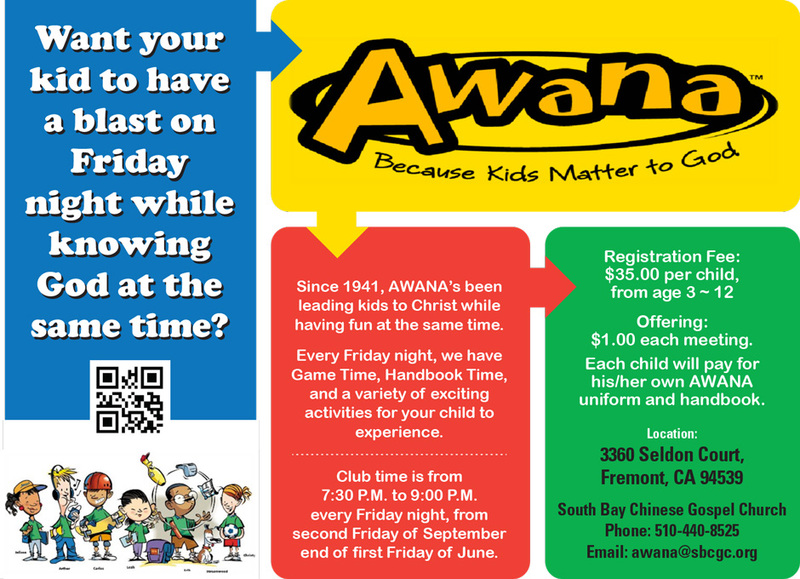 Each child pays for his/her own AWANA uniform and handbooks. 2. Every parent is asked to sign up as the room helper for one month during each Club academic year. *Please refer to the calendar for detailed class schedules.